everett.peacock.com: FREE on KINDLE - "Tiwaka Goes to Waikiki"
FREE on KINDLE - "Tiwaka Goes to Waikiki"
FREE on AMAZON.com for the next 5 days. ** A magical and well textured addition to the series! 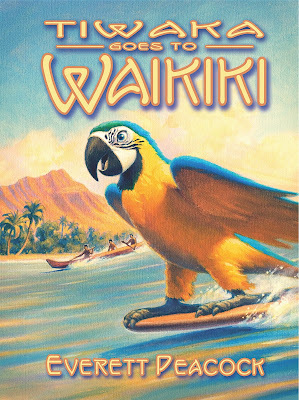 Tiwaka gets his Flight Status upgraded and soon gets in trouble in the tropical skies of Hawaii. After landing in faraway Waikiki he finds he is not the only parrot in trouble. Book 3 in the continuing adventures of Tiwaka and his crew from Tiwaka's Tiki Bar & Grill. Buy this one for your friends, your kids, your loved ones! #1 Amazon International - "Death by Facebook"